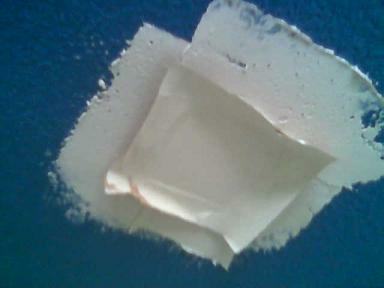 For perfect sheetrock repair zip 78666 - call me. Any home or business in San Marcos or Hayes and surronding counties. Patching and texturing and painting for a nice quick service to have your home looking great in just a day or so. One room -or many. We also do any other repair to just about any other item - we are rental repair specialist. More sheetrock repair zip 78666. How to patch holes and cracks in walls, ceilings. The hole in this ceiling was cut into a square on damaged area in the wall. This is how to do a professional patch - like I do. 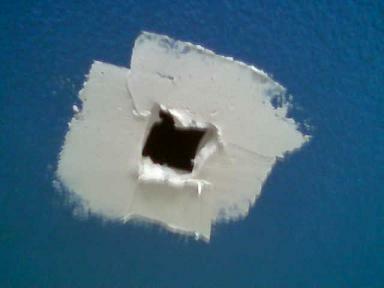 A scrap piece of sheetrock, twice the size hole opening size is selected for this patch - in this example, 10 inches by 10 inches. This marking is on the back, tan side of the patch so the white front portion is left to use in the finish process. You marked with pencil a square in the center, back of the patch, pencil lines relating to the opening size of the square hole. The lines run from edge to edge - with a square appearing inside what looks like a letter H.
Use a razor blade knife to cut along the pencil lines of the H.The knife cut should penetrate thru the paper and into the white chalky material about 1/8 to 1/4 of and inch - not all the through. Lay one of the cut lines horizontal to the edge of a table and gently tap it with your palm and the sheetrock will split down at an angle. Repeat on each line so the square is left in the center. Now, gently bend one section away from the square. Put your finger along the folded-down underside, against the paper. Now attempt to roll the lose hanging downward piece such your finger becomes a fulcrum - and downward pressure will begin to separate the sheetrock away from the paper - leaving the square undisturbed. I usually make additional knife cut lines an inch apart and closer to the outside edge - and begin the separation in sections, working my way around the H square. Clean up the square so its free of debris. You end up with 2 inches of paper around the square. Do a trial-run by placing the patch into the hole. If to big, shave a bit off then square - being sure to not cut the paper we will use as the finishing border feature - as shown in the picture. Put joint compound a quarter inch thick around and in the wall cut square. put a 1/4 inch bead of joint compound around the sides of the square of the patch - and gently work it into place. Slide a 6 inch wide putty knife gently from the center of the patch now in place, to the outside edge in all directions. Repeat a couple times and wipe off the collected material so p knife is clean each swipe. Press the p knife such it levels the square surrounding hole area. The compound should all be squeezed out to the outside edges bonding the patch and it paper closely to the patched surface. Now layer a 1/16 inch of the removed compound over the entire patch and beyond about 2 inches so the entire patch is hidden. A couple of tries will smooth the compound free of ridges and bumps - making a quick and easy sanding finish possible. A paint roller rolled into a gravy-like mixture of compound - and rolled one time over the patch will add a texture to remove the smoothness of the sanding and blend with the surrounding. A texture blowing device a pro would use would apply the exact texture - for a perfect finish. You may not need a perfect finish doing it your self. But my job -after painting, looks perfect. Need sheetrock repair zip 78666. In or around San Marcos, Texas? Call me if you want me to help you fix up and paint your home to look brand new again for family and friends.